Z’s birthday at a random hotel with bad art a few years ago. Z’s birthdays always start off with the ceremonial presentation of gifts while he is still in bed, with only the top of his head peeping out from beneath the quilt, and this Friday was no different. I’m not sure how this tradition got started, particularly since I was always a save-the-presents-until-the-end-of-the-day-so-there-is-something-to-look-forward-to kind of girl, but Z loves his birthday and likes to start it off right. Because I was born early in the new year, my birthday has always signified the end of the holiday celebration, and so those last few hours of gift joy were to be savored. Z’s birthday is on the other, better end of the holidays, so maybe this is why we have such different “birthday styles.” Though we do both seem to be in agreement that we should stretch out the celebrating for multiple days. We’re extravagant like that. This year there were very few surprises because he’d given me a list of things he wanted and I wasn’t feeling very creative. The bulk of his gifts were treats from Zimbabwe that he wanted, as well as a request for a duplicate silicon spoon for the kitchen because—full disclosure—I don’t always do dishes immediately and he’d like to have a spare so it’s ready for the next day’s meal preparation in case last night’s is still dirty. (Z is an excellent cook and I am not, nor am I an enthusiastic dish washer.) Honestly, the biggest surprise I could muster this year was one of those Slushee cups like I had when I was a kid—you know, you freeze the inner part and then later pour a soda or Kool-Aid into, scrape the sides a few times, and voila!, instant frozen beverage. That’s right. Z and I may be middle aged, but we act like eight year olds. A Slushee cup is a good present. (I really am pleased with myself for thinking of it.) 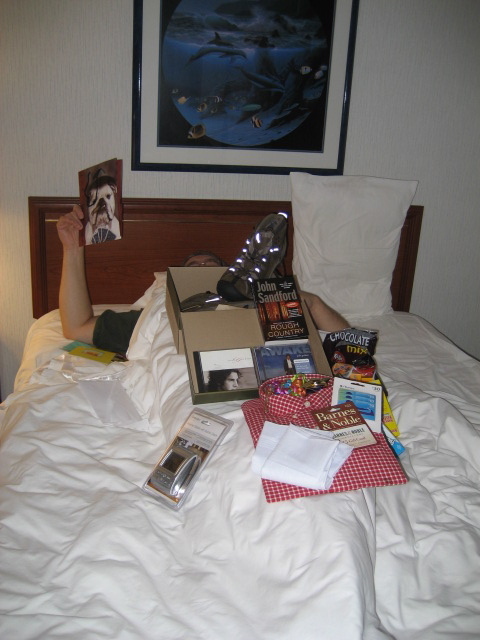 Had he not forbidden me to show you examples of his annual birthday gift bed, I’d post one here. We always do a before photo, when the presents are still nicely wrapped, and then five minutes later, I take an after photo and it looks like a windstorm blew through. Twelve years ago, I met Z at a beginning of semester party at the nameless Indiana university where he’d just been hired as a visiting professor and where I was a lecturer. It sounds dramatic, but the minute I saw him leaning against a post, sipping a beer, and talking about fishing on the Zambezi with his brother and getting chased by hippos, I said to myself—and then drove immediately to the house of my oldest friend so I could have proof that I’d said it aloud on September 15 , 2001—I’ve met the man I’m going to marry. Who I forgot to tell was Z. In fact, a month later when his birthday rolled around, he still thought we were just colleagues who shared pleasantries at faculty meetings. His birthday that year fell on a faculty meeting day and he arrived with donuts in hand to celebrate. As luck (and a little pre-planning on my part) would have it, we sat next to each other at that meeting. During a lull, I asked what he was doing for his birthday. I’d never been so bold as to ask a man out, but I couldn’t stand the thought of my future husband sitting on a lawn chair in his apartment in lonely splendor on his birthday, so I decided that I’d see if he’d like some company. Before I could ask, though, he said he was flying to Minnesota to visit friends. Immediately, I imagined some horrible girlfriend there that I’d have to do battle with, but instead of walking away in defeat, I got crafty. I’m a terrible, terrible liar, and that, more than morality, is the main reason I do so very little of it. I’m not even good at faking enthusiasm for things I don’t like. But I had to think fast, so I asked how he was getting back from the airport when he returned. He said he was taking a cab, and I said—seriously, my only successful lie ever—“As luck would have it, I’m visiting my step-mother who lives right by the airport on Sunday. I could pick you up if you like.” This was not a lie technically in that I do have a step-mother and she did live by the airport and I could visit her, but none of that had been planned. He didn’t immediately accept and I thought perhaps he’d seen through my ruse, but Z is a thrifty guy, and so after the initial pause, he agreed. I spent the next three days while he was in Minnesota painting my nails and plucking my eyebrows and trying to pick out an outfit that didn’t look like I thought I was on a date but that was still alluring. (Very difficult to accomplish.) On the forty minute drive to the airport—and no, I never did make it to my step- mother’s—I constructed a list of conversation generators, and I showed up fifteen minutes early, pacing in the arrivals hall, wondering who this Beth was who was suddenly so convicted of what needed to belong to her. And there he came through the arrivals gate looking slightly hung over. I don’t remember much of the drive back home, only that it was as impossible to figure out if he had a girlfriend in Minnesota as it was to figure out if he had any interest in me. We talked easily though I found it difficult to focus on the content of what he said because his accent was so intoxicating. I’d ask a question and realize ¾ of the way through his response that I had no idea what the answer was that he’d been giving me. (He would say I am still this way, and it has nothing to do with his accent and more to do with my under-developed listening skills.) The forty minutes flew by. Towards the end of it, I suggested an outing for the following weekend, and he agreed. Much to my chagrin, it wasn’t a date. Nor would the next five years worth of activities and birthday celebrations. He remained completely oblivious to the fact that we were meant to be together, and even seemed to skip over the part where, after two years, I suggested to him that maybe it was worth considering. I spend a lot of time talking about how awesome Z is in this blog because he IS awesome. He was completely worth the wait. But I have to say, in the years between 2001 and 2006, I was the awesome one. If they gave one out, I’d have earned the Congressional Medal of Unrequited Love during this period. I was a trooper, though at the time, I think most people and one shrink thought I was either deranged or pathetic because I couldn’t let go of that idea I had of the two of us as a couple. In 2006, Z had just moved to Seattle from Zimbabwe. He had been offered two jobs and because I was starting to suspect that possibly everyone else was right and nothing would ever change between us, I suggested he take the Seattle job instead of the Pittsburgh offer only because I’d never been to Seattle and it sounded like a good place to visit. For his birthday, I flew out to see him and met this city for the first time. While nothing changed ON his birthday, everything changed during the week of my visit. Z had had an epiphany of sorts and wondered if I was still free or willing to consider possibilities between us. Was I free or willing? Ha. Like I was going to suddenly, after this long wait, start railing against destiny? I don’t think so. So now, on the occasion of Z’s birthday, I feel extra happy. Not just because I’m glad he got born or because we get excited about things like Slushee cups and Chia pets that other people our age are probably too busy and mature to care about, but because it’s also like the birthday of us, twice over. Though in retrospect, I’m thinking maybe I should start demanding presents on his birthday too. If you don’t look in the right places where things are still lovely, it’s a heart breaker. I was raised to appreciate the town’s history and my heritage. How Quakers (and ones I was related to, which gave me a sense of unearned pride) from North Carolina had made the trip northwest, in part, because they disagreed with the institution of slavery. I knew which parts of town had been settled first, how the gorgeous, crenellated courthouse had a hanging balcony even though no one had ever been hung there, and what businesses had been on what corners at a time that pre-dated me. I grew up in the oldest part of town before it had been revitalized, and I knew that the streets used to have names instead of numbers and on certain buildings you could still see the street markers embedded in the brick. Market and Marion was my favorite intersection, a block from my elementary school. There was something about these hints at how the place used to be that made me wallow in melancholy and long for a past that I was sure was better (and more aesthetically pleasing) than my 1970s reality. In addition to the town’s history, I’d also been schooled on family history as it unfolded in this town. I knew which Catholic church the Irish people went to and which one the Germans went to, where my maternal grandfather’s car lot had been, how my other grandfather worked at the old post office, now the site of the Indiana Football Hall of Fame, where my parents met, how my great aunt worked at the Hoosier Store , where the furniture store had stood before it caught fire in the 1968 explosion that killed a great uncle. I could locate the place where the interurban used to run, connecting Dayton to Indianapolis. I wondered at a postal system that had two deliveries a day and what it must have been like to live at a time when a horse and wagon brought milk (and ice!) directly to your house. I knew the location where the “girlie” shows used to be that an otherwise God-fearing great-great grandfather was reported to have visited with some regularity. Somehow I knew it was important to remember and acknowledge this past, despite the fact that people in towns all over America had similar memories and histories. But I liked wallowing in the notion that somehow “my people” had been living life more lovely than I was, and so often I would spend as much time thinking about how it all “used to be” for them than I did noticing the present I was actually inhabiting. One day before I got married I was driving across the new bridge, hollering to myself about how ugly and modern it was compared to the old bridge. Suddenly, I was struck by the notion of how much simpler my life would be if I weren’t always reflecting on a past that wasn’t even mine. 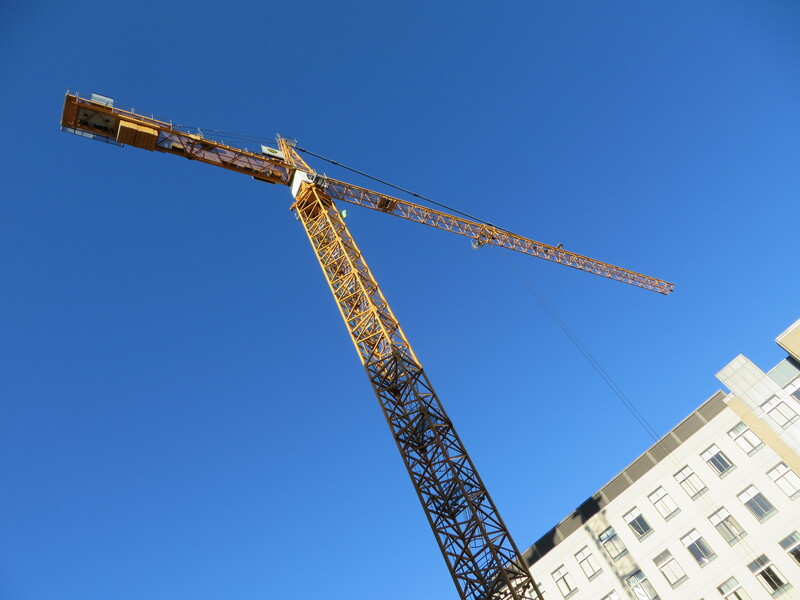 I imagined it would be the most astounding kind of liberation, not to have to feel your blood pressure go up when a favorite building was demolished or when another big box store usurped the heart of downtown. What would it be like to just live my life and not drive past the Leland Hotel without having bricks and mortar trigger a spiral of thoughts including the hotel’s former grandeur, how before it was a building, it was the site of a casket factory where my great grandfather worked at the end of the 19th century, and from there have my imagination take over with constructed memories about how hard it must have been for him to leave his parents in West Virginia, and how hard it must have been for them to leave Ireland and back and back and back . On a drive from one side of my small town to the other, I could have been crushed by the weight of other people’s histories. And then I moved to Seattle. I missed home regularly, but after a few months I was struck by how light I felt in a city where I had no emotional attachment to anything. It’s as if the Rockies and the Cascade Mountains were holding back all the history of home that had made me broody my whole life. It was a strange sensation to listen to the news and realize I didn’t particularly care if the heavily trafficked but sort of hideous viaduct downtown was demolished. If I saw a wrecking ball, I didn’t assume it was destroying something historically important. Instead, I’d cross my fingers that a grocery closer to our apartment was going in. Because Seattle is younger than my hometown and none of “my” people had settled it, I’ve been detached as it moves and shifts around me. But lately…I find I’m suddenly aware of the changes that happen in my vicinity, and I don’t always like them. Two years ago the grocery down the street that was perfect if you had a late night baking or cooking need went out of business, and I’m still bitter about that loss, but it was more an issue of being inconvenienced than feeling like the fabric of society was ripping. And of course I was upset when two bookstores I regularly visited went out of business, but that’s how I feel about all independent bookstores everywhere that can’t compete with that other colossal “local” bookstore (that begins with an A). No, what I’m noticing now are much stronger negative reactions to changes like the disappearance of an entire swathe of diverse buildings in Capitol Hill—the gritty sort where you can imagine what Seattle was like before the rest of the world discovered it and started fancying it up—which have been replaced by layers and layers of living space that looks identical to the apartment tower next to it and behind it. In the seven years that Z has lived here, Broadway has become more upscale strip mall and less quirky neighborhood haven for artists and social outcasts. I still can’t even talk about the heartache of the neighborhood Greek diner going out of business and being replaced by something Asian. Other, smaller changes have begun to bother me: a re-configured turn lane to accommodate the streetcar that will soon be in place (a good thing, really, but still, it rankles); a dirty-looking hookah bar, parking lot, and drive-thru coffee hut bulldozed in one fell swoop for yet another apartment tower in an area that doesn’t really affect my normal line of sight, but I find the shadows from the taller building off-putting; the removal of an authentic Mexican restaurant so a Mexican food chain could go in its place. Last week I was mentally growling at a crane and pile of rubble two blocks from our house and realized that I had finally gone round the bend. I was lamenting the absence of what had only ever been a façade for the whole of our Seattle experience. Someone knocked down a building, left the front of it standing, propped up with two-by-fours, and the debris left behind was inhabited only by some street-smart raccoons. What exactly was it that bothered me about that particular eyesore being replaced with the promise of something more substantial (and less raccoon-y)? The best I can figure is that what I’m railing against is having the backdrop of our history here changed. When Rick first came to Seattle and I started visiting, we were focused forward: our newly discovered love, a new city to explore, a new phase of life. Our history was miniscule—there was nothing to pin to the corkboard in our minds of “how it used to be.” It was a good time; everything was in the present tense. We may never have gone into the Lusty Lady, a downtown hot pink peep show venue that had been hawking its wares with some hilarious and pun-filled signs for 27 years, but it was part of the landscape of our new life together, and all that mystery and hope. There’s still plenty of both of those ingredients, but some chapters have been written now. When we walk by what remains of the big pink marquis and see “Space for Rent” in place of “We Take Off More than Boeing” it feels a little as if “Early Beth and Z” is being slowly erased. Fortunately, new memories are being constructed here daily. Sometimes on weekends Z and I get this awesome $9.99-a-day car rental from Enterprise because we’re “preferred customers.” The only time this is useful is in the winter when the tourists have gone away and there is a surplus of cars or when we are at the airport rental facility where we can zip into the preferred customer lane and by-pass the line of people, who are generally looking at us as if they hate us. (If I’m dressed well and can pretend I’m someone important, it bothers me less, but when I look like a hobo, I feel guilty because normally I’m just one of the poor slobs waiting in a tedious line right along with everyone else.) In fact, this summer right before we left for Zimbabwe, being a preferred customer was not helpful at all. We tried to return a car to a different location the day before we left to make our schedule a little less tight, and the preferred customer customer service representative basically said, “tough luck” and then had the nerve to ask, “Is there anything else I can help you with?” seemingly oblivious to the fact that he hadn’t helped me at all. Normally, I’m so sweet and placating to service people that I make myself nauseous, but because I was stressed out from packing, I had no sweetness to give this person in a call center in Dubuque who was not sympathetic to my plight. So I said very sharply, “Well, the time to help me would have been now, and you can’t seem to do that.” The thing about a cell phone is that it is not so satisfying to hang up as a phone with a cradle, where you can take out your frustration on a safe, inanimate object. Remind me why I’m telling you this story? See, I just got all annoyed again and lost my train of thought. Okay. I think I’ve got it. So Saturday we had a rental car simply because it was cheap, I had a baby shower to go to, and the whale bathtub that the impending baby was getting as a present from us would have been a pain to tote on the bus. After the shower was over, Z picked me up and we were both pleased that I’d scored a jar of peanut m&ms as a game prize and a jar of homemade jam from one of the hostesses, but we couldn’t figure out how to celebrate my winnings. We made no plans for the car beyond the drive to the shower. We weren’t ready for the day to be over, but driving around aimlessly seemed pointless. 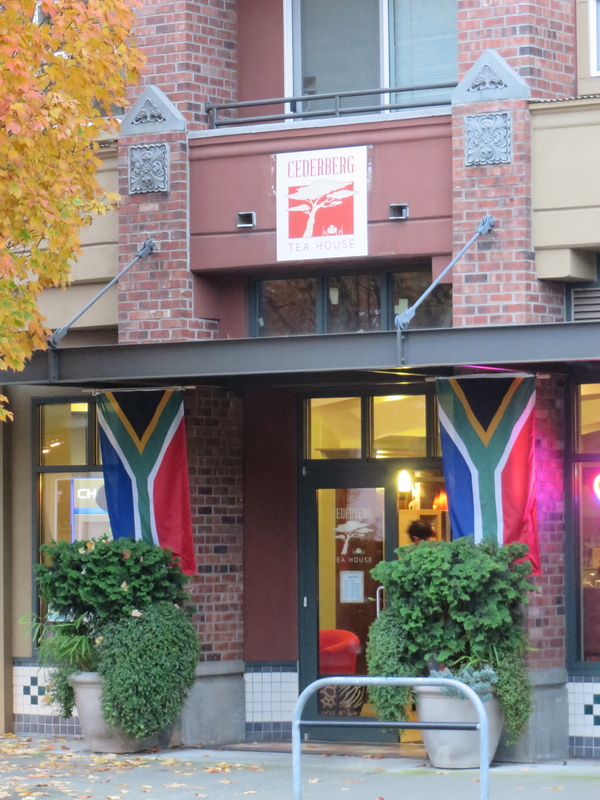 Fortunately, as we got closer to home (exclaiming over every red, orange, or yellow tree we zipped past), Z remembered that there was a South African tea shop that he’d been wanting to check out in Queen Anne. We couldn’t remember the name of it or where it was exactly, and my semi-smart phone was dead, so we were flying blind. I vaguely remembered that the front of the building where it is was “kind of roundy” and Z was fairly certain that it was upper Queen Anne at the top of the hill. So we drove and went ahead and parked in the area where we thought it might be, and we were about to cry uncle and go to Chocolopolis, which looked promising. And then I spied the South African flags. Above it was this sign, with what might be the world’s most charming business logo. 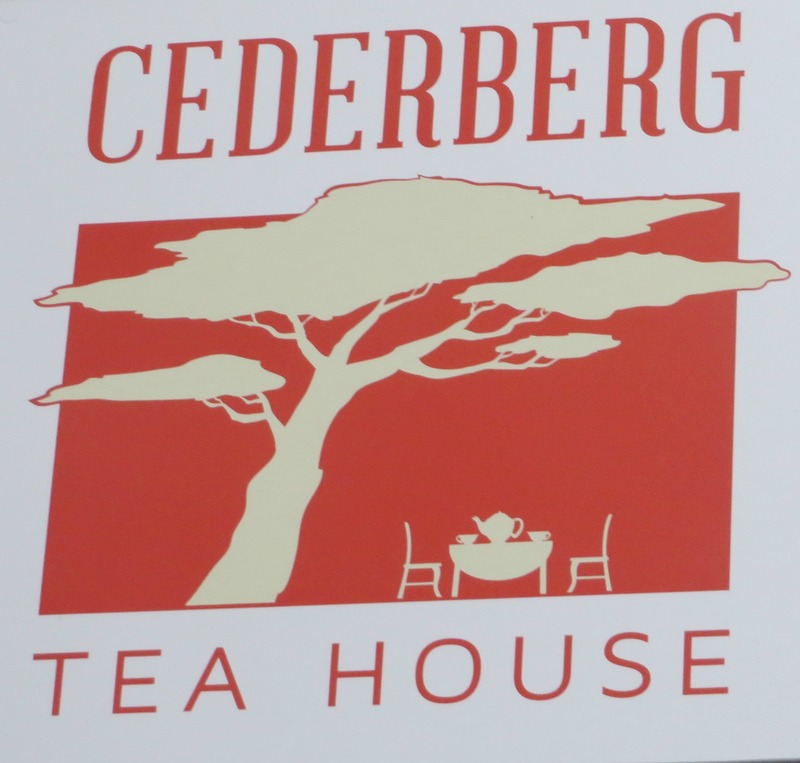 In a land of coffee houses and no southern African food, Cederberg Tea House was a real treat for us to stumble upon. Rick often misses the tastes of his “real” home and goodness knows, if it’s not Pop-tart Surprise, I can’t duplicate it. The shop was inviting. There was a good bunch of tables and chairs, plus the requisite sofa and overstuffed chairs by a fireplace. Photos of African animals lined the walls, and there were even two stands that displayed various specialty items that I’d been looking at with some regularity with Z-ma in Harare. (Who doesn’t want Eat-sum-more cookies?) My favorite thing there though was a collection of Origami African animals that had been folded out of animal print paper. Adorable. The South African woman who runs the shop with her parents and her husband greeted us warmly even though it was close to closing time. 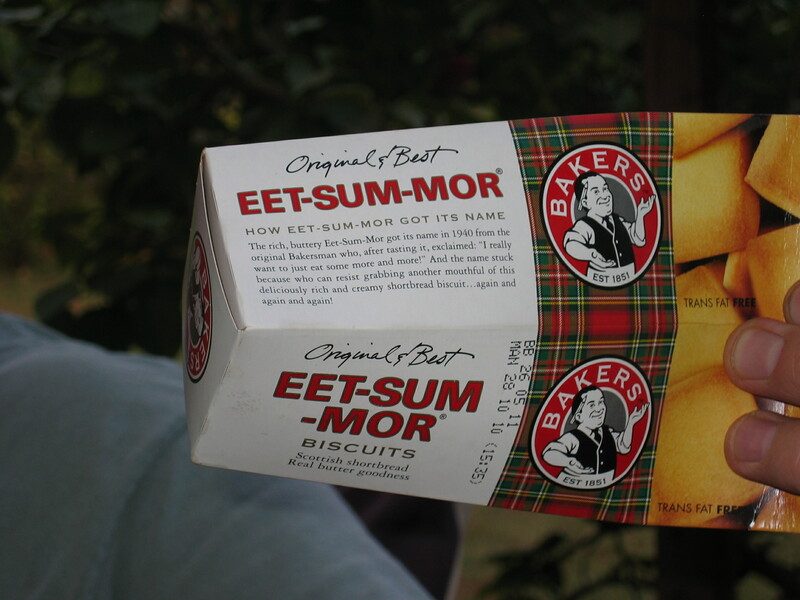 She recognized Z’s accent and so they talked briefly about home while I peered in the case at the koeksisters and melkterts. We ordered a pot of black tea and then listened as other customers came in and the woman explained to them the variety of teas they had and their special concoction that makes a sort of tea espresso. Our pot of tea came in a groovy pot on a contemporary tray. A delicious butter cookie each rested on the doilies under our very modern cups. In addition, we’d each ordered a koeksister. The verdict? Delicious. The tea was good. We personally think Z-ma’s koeksisters are more delicious and certainly we appreciate that she presents ours to us in a plastic tub filled with multiples of the little syrup-soaked pastry twists, but these at Cederberg Tea House were a very, very close second, so we were not complaining. We stayed longer than we meant to, making comparisons and reminiscing about our time in Zimbabwe last month. We studied the menu to see what we might get next time (sandwiches!). It was a bit of unexpected fun that our rental car drove us to this weekend, and I think it may get put on the “things our guests should experience” rotation, since most of them might not have a chance to go to southern Africa. You really shouldn’t have to live your life not knowing what koeksisters taste like. One of the things I’ve learned to love in Seattle is a sunny day. It’s not that they’re exactly rare here (Indiana has its fair share of grey), but when the sun is out like it was today, it’s a celebration and I don’t want to ignore it on the off chance that I won’t see it again until May. I could hardly say no to a writer who promised not to speak. Fortunately, it was a day when I was feeling great love for Seattle and all its people and not one of the days when I want to scream at passersby, In the name of all that is holy, can I not have two quiet square feet to myself for fifteen minutes? Because it was a good day, I sat beside this stranger and wrote. I tapped words into my computer and he scrawled out pages in a dark script on a steno pad. I wasn’t tempted to look surreptitiously at what he was writing, though I did glance at him out of the corner of my eye when I heard him reading what he’d written under his breath. The sun had started to go down and it was too cool to comfortably sit still and write anymore. Z would be coming along soon and there was a particularly bossy corgi on the green that I wanted to see up close. I packed up my stuff and the man said, “It’s been a pleasure writing with you. You’re an excellent writing partner.” I commented on his handwritten drafts and my need for the keys clicking under my fingers. He told me to have a good evening. The end. Perhaps I am capable of getting together with someone and writing so long as he or she is a total stranger. Before you know it, I’ll be writing in coffee houses just like a bad Seattle cliché. So that’s it. One perfect fall day. 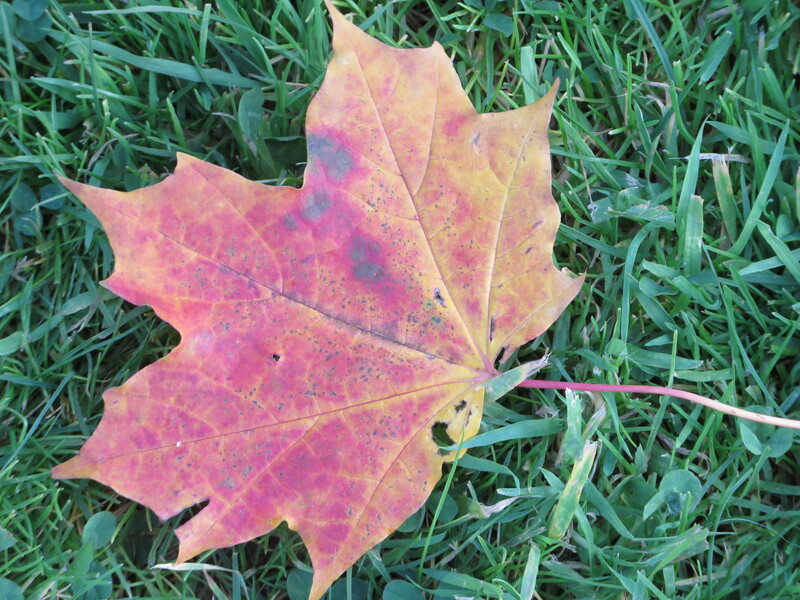 If the rain comes this weekend and knocks all the leaves down, I won’t be able to complain. Sometimes I feel stuck and I have no idea how to unstick myself. 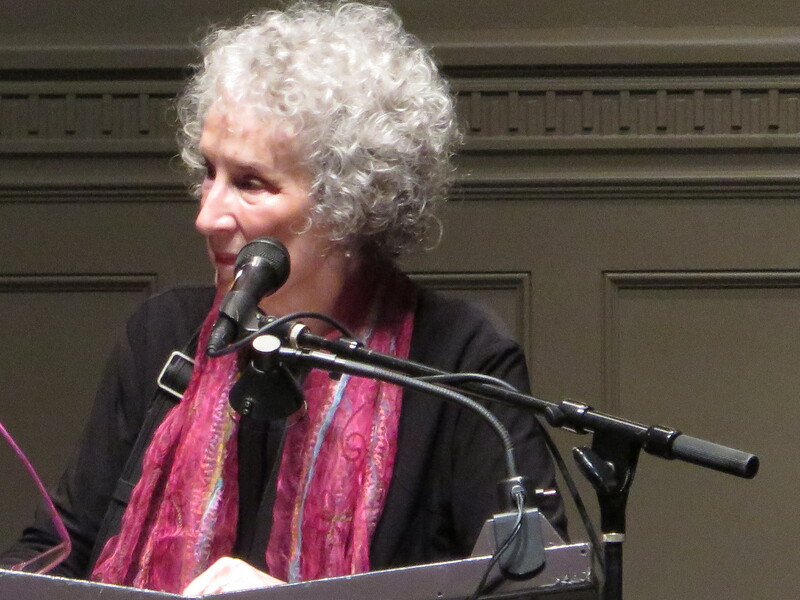 My lack of traction at the moment is that for over a week I’ve been wanting to write a post about Margaret Atwood, a literary idol of mine, who spoke at Town Hall Friday before last. None of my words seemed worthy of hers. When I read her dystopian novel, The Handmaid’s Tale, in college, it changed my life irrevocably. I don’t say that easily about many books, and maybe at 20 I was ripe for change and new ideas anyhow, and her writing just happened to be what I latched onto. Shortly after I discovered her, I heard her speak, and then spent part of my twenties wishing I were more like her: cleverer, more driven, more prolific, more talented, and considered part of the literary canon. Maybe it’s not surprising that I’ve spent ten days typing a line and deleting it, only to start again with a slightly less good line. I’m hoping I can sneak up on it sideways to see if I can get the job done. Town Hall has nothing to do with city governance in Seattle and everything to do with culture, and though I often curse on nights when we have a rental car and can’t find parking because there is a concert or speaker there, I have to admit that one perk of being in Seattle and living on First Hill is that Town Hall is a single short block from where I live. The building itself is gorgeous. It’s a Romanesque revival-style (former) church built nearly a century ago in what was then Seattle’s first suburb but now feels more like downtown. 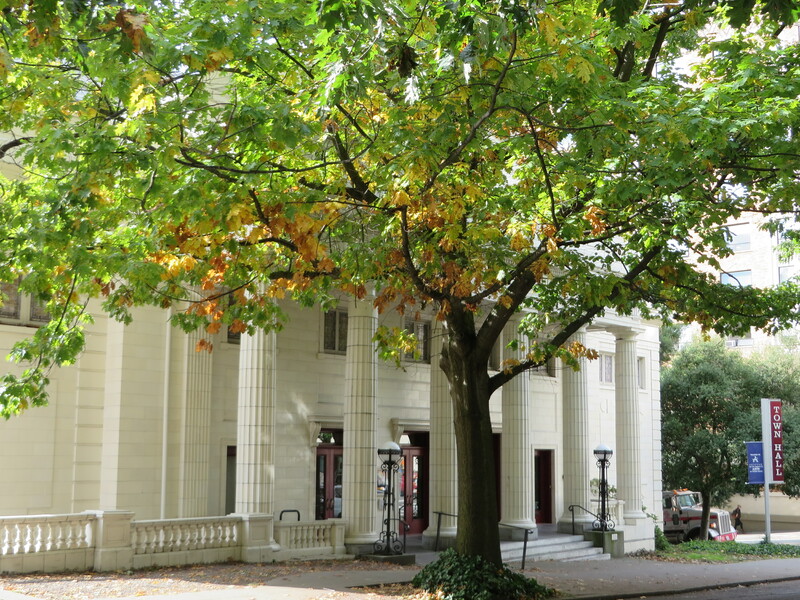 In the late 90s it was turned into a cultural center for music, readings, cultural discourse, etc. Outside it is an expanse of white with huge columns. Inside it’s all arched auditorium, groovy old light fixtures, and open space. (My only beef with it is that it has old wooden church pews and while that was not a problem at an hour-long author event, the nearly three hour medieval music concert awhile ago felt like it lasted six. But the pews do look good!) Town Hall is one of those places I admire when I walk past but completely forget. I’m often discovering two days after the fact that some author or speaker was in the house. When I do managed to go inside, I’m inevitably annoyed with myself for having been away so long. Perhaps it’s not surprising that I like being inside of this space. When I travel, I love to find an old church or cathedral and sit on a pew for a while and look up at the arches and think my thoughts while other tourists mill about and the more penitent pray. And though there’s no preaching in this structure, it still has that churchy feel. I grew up with a firm belief in a Christian God, though because my father was Catholic and my mother was a Protestant who was prone to sometimes follow the suggestions of friends and neighbors about what Protestant church was best, my church attendance was a smorgasbord of liturgies. I had no idea which one was “right”, (though a few were convinced that all the others were wrong), but I found the ritual in each fascinating, I loved, particularly, sitting in the oldest churches in my hometown imagining the generations of people who had sat there before me. One of my favorite periods was when we went to the century-old Presbyterian church with the gothic arches and Tiffany windows. I often left these various church services with a simultaneous sense of wonder and envy that the congregants in each church seemed to feel that they belonged there. On a rare occasion, I’d feel a little fresher. If I’m honest, I was bored a lot when the ritual stopped and the preaching started. I’m not the best listener if the topic doesn’t interest me, and I’m a particularly bad listener if someone is trying to boss me up, which seemed to be a recurring theme in many of the churches I went to during my formative years. The ones I loved most were heavy on ceremony and the ones I liked least were those obsessed with the End Times. The only time I ever felt the sort of belonging that I imagined others felt, was when in my thirties I was on a quest in Chicago to find the church where Madeleine L’Engle–my first contemporary literary idol–had gotten married. I was in a stalled relationship and was being pushed from all sides to make a decision about whether it needed to be totaled or have the engine rebuilt, and I suspected that if I was in the church where L’Engle had married the man that she would write about so lovingly in her Crosswicks trilogy, I could figure out my future. This really had nothing to do with God in that if L’Engle had gotten married in Lincoln Park, I probably would have headed there and sat on a park bench for an hour with a squirrel while I tried to come to some conclusions about where my life was headed. Though I went into that church, St. Chrysostoms, hoping to walk around anonymously in the quiet, there happened to be an all-day service in progress for Good Friday, which entailed readings from the clergy and long periods of silence for reflection. I sat down to be polite and tuned the readings out, but at some point realized that while there were the expected passages from the Bible being covered, there were also gorgeous passages being read from both classic and contemporary literature. And while the passages addressed the obvious issues of sin and redemption, it was a fresh way to tell an old story and it hooked me. My synapses started firing. Suddenly I was not just looking at the architecture and wondering exactly where Madeleine L’Engle and her husband had stood or who was present for their wedding or if they used traditional vows. In fact, I quit trying to channel her at all and instead just sat in the silence that followed each reading as the words from the novels and poems reverberated inside my head. A denomination that recognized and held up secular writing as examples of beauty and testament to the human struggle seemed infinitely more holy than some of the repetitive and occasionally mean-spirited words of a man in a robe or cheap suit or blue jeans and blazer, preaching whatever his particular brand of gospel was. Who knew this was possible? Now? I can’t believe I considered not going (to the reading, not the moon colony). The woman who introduced Atwood mentioned how important The Handmaid’s Tale was to her, how it changed her life, and I looked around at this former sanctuary full of women and men of all ages and races nodding their heads, and I was transported back to the late 1980s when I first held the book in my hands and realized feminist wasn’t a dirty word, when I realized that a few of those churches I’d found myself in as a child had been selling fear instead of comfort and could have been rough drafts of the theocracy that wreaked havoc in the lives of the women in Atwood’s novel. Or when I realized that words could be powerful. Margaret Atwood herself came out, clutching her purse to her side, as if, perhaps, one of us might leap up on stage and steal it. She never did set it down, though she seemed to instantly warm to us. She had this look of amusement on her face, like it was fascinating that anyone would have bothered to come hear her. When I counted up how long it had been since I last saw her and realized it was twenty years, I was shocked to see how unchanged she seemed to be. Everything out of her mouth was either hilarious or wise, or both. She reminded me of my favorite sorts of college professors—that is, I wanted to write down everything she said in my little notebook but I couldn’t write quickly enough. I can’t remember specific nuggets of brilliance or inspiration to report here, but I do know she managed to make her responses to tired questions sound fresh and thoughtful. At one point, a young woman asked if a story she’d heard about Atwood’s time at Harvard when “girls” weren’t allowed to use one of the libraries was true. Atwood repeated the question in an overloud, comedic way, making her voice reverberate throughout the auditorium. She talked briefly about how, yes, it was true, and that the work she wanted to read there was modern poetry, but because she was unable to scan those shelves, she went instead to a different library not afraid of admitting women. There she found a bounty of Canadian literature, the implication being that it shaped her writing in significant ways. She had done what women had been doing for centuries: she found inspiration where she was able and discovered something she might have otherwise missed. The young woman commented on how calm Atwood seemed about this. “How are you not angry?” she asked. There was something striking about seeing this young woman, full of righteous indignation, at roughly the age I was when I first read The Handmaid’s Tale, Atwood, full of the wisdom and experience of her seventy-three years, and me, pig in the middle. When I saw her at 25, I wanted to BE her, but all of these years later, I am content to be myself, even if I’m not famous, haven’t won any literary awards, and don’t have a Wikipedia entry for myself. Though I admit she’s the kind of older woman I’d like to grow to be. I’m still not satisfied with this post. My threads aren’t pulling together as tightly as I want them to. Other than the architecture, I’m not sure why hearing Atwood at Town Hall in Seattle reminded me of the churches of my youth or my first realization that I was more comfortable in spiritual practices that ask questions instead of those that give rigid answers. All I know for sure is that when Hudge and I got caught up in the crowd as it exited the building, it was like the end of a good church service. I felt electrified and blessed.